Caramel apple trifle is an easy dessert you can whip together in under 30 minutes. This luscious layered treats combines tart Granny smith apples with store bought pound cake , light as air whipped cream and rich salted caramel sauce. 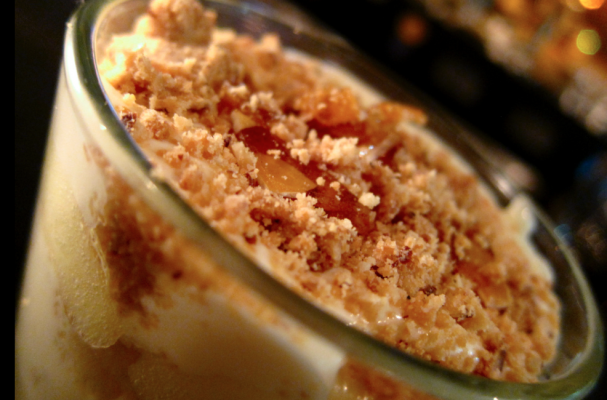 Trifles are terrific for a feeding a crowd because people can scoop their individual helping. Also, I recommend serving this dessert in a glass bowl so your guests can see the various layers, after all that is what makes it so pretty. Melt butter in a large skillet over medium heat. Stir in the apples, walnuts, brown sugar and 1/2 teaspoon apple pie spice. Cook and for 8 to 10 minutes, stirring frequently. Apples should be tender and the sugar should have completely dissolved and form a sauce. In a large cool bowl, beat heavy whipping cream with vanilla extract until stiff peaks are formed. Using a stand mixer or hand mixer, beat cream cheese until smooth. Beat in 1/2 cup salted caramel sauce and remaining pumpkin pie spice. Fold in 2 cups whipped cream. In a 3-1/2-qt. trifle bowl or glass serving bowl, layer a third of the pound cake cubes, cream cheese mixture and apple mixture. Repeat layers two more times. Garnish with remaining whipped cream and drizzle with remaining salted caramel sauce. Sprinkle with additional pumpkin pie spice. *Chill the bowl and beaters for at least 15 minutes before whipping the heavy cream for the best results.